Picture courtesy of Aleck Pelchat. NOTES: Like YoJoe, I've listed the Gold Head Steel Brigade figure (as it is commonly called) as version two because it is significantly different than the other versions. 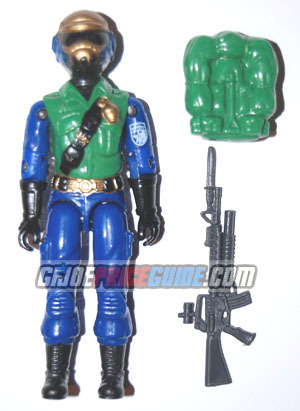 YoJoe says this figure shipped somewhere around 1992 and 1993 as a mail order exclusive. This is by far the hardest version of Steel Brigade to find. MOC means still sealed in his baggie.